High energy or low, or in between? Is your dog dominant or submissive by nature? Do you live in a big house with stairs and a yard, or a small apartment in a busy city? Do you have other dogs and/or cats? 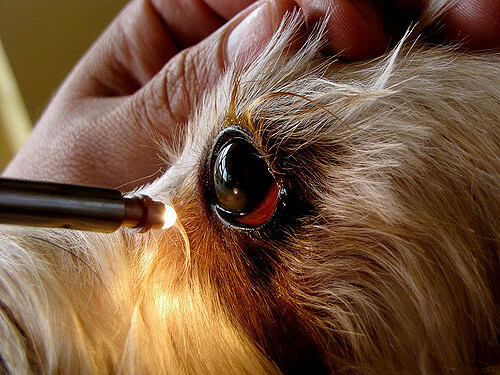 Was your dog blind from birth, or did she become blind suddenly or gradually? Has she always been your dog, or is she a recent member of your family? Addressing each point is beyond the scope of this article, but you have resources, even a support group (find links at the end of this article). You’re not alone, so don’t panic. Lily came to me about 95% blind. When she went completely blind within two years of my adopting her, she entered a period of depression -- and adjustment -- where she felt safest in her closet, her own private cave where, I believe, feeling the limited space around her gives her a sense of security. I did not force her out of it. She came out willingly to eat and I coaxed her out for walks. This period lasted about six months. Now she still goes in there for naps or for the night, but just as often, she doesn't. This is my first time in a relationship with a dog who is not constantly focused on me. Lily has to use all of her remaining senses, all of her own mindfulness, just to navigate in the world. I am here to make the way as easy and as comfortable for her as I can. That does not mean feeling sorry for her. To give her the best life possible, I balance between being aware of and accommodating her disability with compassion and patience and not turning her into some kind of pampered, neurotic little invalid. For example, when I first got her, with her limited vision she did not want to walk outside. Who could blame her? I live on a busy Manhattan street. She was paper trained so I could have left her in her comfort zone, languishing forever in my small apartment just looking forward to her next meal. I determined this would not be her whole life. In time, we learned together to have a pleasant walk. Then she went completely blind, and we had to start all over again! But she now walks with me on the streets, sniffing everything. The first time we went to the park, she was totally disoriented in a place without sidewalks or curbs. That required another, shorter, period of adjustment. Now she enjoys sniffing in the grass and dirt. I keep the leash short. She is in roughly the heel position all the time, where she has the security of knowing that if she trusts that space and that tension on the leash, I won’t let her run into anything. I tried a halter on her, but she was stressed and disoriented in it. Though the books recommend halters (for many dogs, this may be the right choice), Lily relies on the feeling of the collar on her neck. The slightest pressure she responds to and I can guide her easily through an intricate obstacle course. This is crucial on a New York City sidewalk where there are deep cracks in the cement, grates, garbage cans, newspaper dispensers – you name it – or in the park around twigs or stones. Occasionally, I have been momentarily distracted and she has bumped into something (we travel at a slow pace so she is never hurt). I feel terrible. She doesn’t dwell on it. She spends no time with “Oh I bumped into that, I’m always bumping into something, my life is awful,” creating a story around it the way I do when I have a mishap. I’ve often read that dogs “make up for being blind” with other senses. Nonsense! A blind dog can’t make up for anything anymore than a blind person can. They rely on their other senses more, but that’s different from the idea that somehow the other senses expand to fill in the gap left by blindness. You have to fill that gap. You are her seeing-eye person. My dog is more careful, more mindful. Our walks are enjoyable, but they also take more mental energy from both of us. She is exhausted after every walk, even though I am guiding her every step. No miracle happens that you and she do not create together, every step you take. Small sounds in the apartment startle Lily. She does not do well in wind and sort of shuts down, perhaps because she can’t hear as well in the wind and it is just a sensory overload. She has adjusted to soft rain, though not without a lot of gentle coaxing over the years – and a nice raincoat. I don’t force her to go farther than necessary in inclement weather. If she trusts that I am confident, she relaxes. If she knows from my energy that I am in control, then she doesn’t have to be. In crowds, I pick her up and carry her. I did that with my sighted Shih Tzu as well. Not everyone is mindful of where they step. I don’t like small dogs in crowds. It makes me nervous for them, so rather than communicate that nervousness to my dog, or put her at risk, I just pick her up and we walk through safely and securely. With a larger dog, this would not be an issue. Know your own dog. Sometimes, even in a familiar space, or doing a familiar thing, your dog may become suddenly disoriented. If there is no risk to her (and she should never be in a dangerous situation – that’s your responsibility) and she can work her way out of it, let her. But use your good judgment and knowledge of her. A little stress occasionally can be stimulating, but too much too often is bad. Lily sometimes gets into a corner or walks under a wood chair and can’t find her way out. I can read when she is going to panic or just give up, or when she’s going to slowly re-orient herself and go out the way she went in. If she is headed for a panic or a shut down, I gently guide her out of the corner or the chair slats with a cheerful, “There you go.” And that’s it. No after story from either of us. No “Oh why did I do that!" etc. “Check your bowl” means I have put her food there. Often it takes her awhile to find it even though her water and food bowls are always in the same place. If it takes her too long, and she has somehow become disoriented, I will point her in the right direction. You have to judge when letting them work something out is best for them and when it’s just unnecessary stress that you can easily fix. Mindfulness. Talk to your dog more than you would to a sighted dog. This tells them where you are and is especially important on a walk. Even though the slight tension on the leash orients Lily to where I am, she is visibly happier and more confident when I talk to her more. We also have guide words. Pausing and then saying the word “step” means we’re at a curb or step. “Step up,” the same. “Wait” means just that, so she doesn’t bump into the lobby door while I’m getting my keys out to open it. In front of our apartment, I don’t have to say anything because the floor texture changes. When she steps from the tiles to the carpet, she pauses without the word. We did not have any training sessions per se. I just use the same words every time for everything we do. To avoid startling her, I say “pick you up” before I pick her up, “pet you” before I touch her. “Go for walky?” before I put on her leash and just my hand on her back before I put on her coat or sweater. On the street, if she pauses and doesn’t want to move forward for some reason, and I see that she’s all right (even a blind Shih Tzu can be willful at times! ), I just say “walkies” in a bright, high-pitched tone. I use this word instead of “heel” because on a noisy street she can hear it better and it’s more cheerful sounding (though it may make me look ridiculous; it worked for Ms. Woodhouse and it works for me too!). The word doesn’t matter, but it should come naturally to you so you use it every single time. Consult all the resources available, but your responsibility first, last, and always is to KNOW YOUR OWN DOG. Use common sense. Some suggestions I read seem absurd or even wrong. For example, one book recommends using poles to guide a blind dog (and certain paraphernalia supposed to serve as white canes for canines). The other book advises never to do this! I agree with the second book, as touching Lily with anything but my hands would confuse and frighten her. You have to be mindful of your dog and pay careful attention to her. You will not get it right 100% of the time, but over time the two of you will fashion a routine and physical environment within which she can live happily and with the lowest possible stress. Perhaps your blind dog came to you frightened, timid, shaking with fear or nervous aggression; or perhaps, if she went blind in your care, began her unsighted life depressed, unwilling to leave her bed in the closet – the joy of seeing her wag her tail on a walk, sniff every pole, street sign, or blade of grass, and happily navigate your home on her own, will fill you up. The fruits of being truly mindful with your dog at all times will be, perhaps, that you learn to live a more mindful, compassionate life. And that will be her lasting and priceless legacy to you. Muffin's Halo - Device that helps guide blind dogs. About the Contributor: Paulette Callen is a writer whose poems, stories and essays have appeared in small journals and magazines, such as The Animals' Voice and Between the Species: A Journal of Ethics. After many years as a resident of Manhattan’s Upper West Side, she has returned, with her rescued blind Shih Tzu Lily, to the Midwest.